The blurb:According to The Nice and Accurate Prophecies of Agnes Nutter, Witch (the world’s only completely accurate book of prophecies, written in 1655, before she exploded), the world will end on a Saturday. Next Saturday, in fact. Just before dinner. What did I think? An angel and a devil who are good friends (after all they’ve been meeting for 6000 years since the world began in 4004 BC) and who like things the way they are, work to avert a plot to bring on Armageddon, with the help of a number of other unusual characters. I suppose I should have indicated a spoiler alert there, but after all, you know already that Armageddon didn’t happen. A fun read, thoroughly recommended. Mentally summing it up as “Just William meets Dennis Wheatley” (does anybody still read Dennis Wheatley?) I was then amused to discover that the book had had the early working title of “William the Antichrist”. I docked a star because some of Terry Pratchett’s later books are so good, and I must keep something for even better books that in many ways are similar. In a less clunky system I would give it 4.8 stars. Wonderfully inventive on every page. The only reason that I wasn’t completely bowled over was that I came late to this clever work. I’ve long admired the surreal comedy of Douglas Adams, which had shown the way earlier, and that plus the influence of this book during the quarter-century since the Gaiman/Pratchett co-operation has made its originality a fraction less startling. 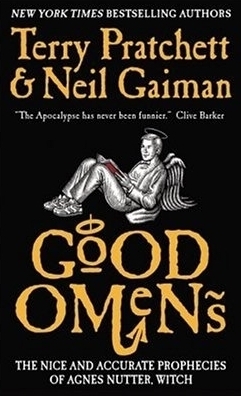 Posted by Megs on May 20, 2016 in humour and tagged 101 things in 1001 days, neil gaiman, religion, supernatural, terry pratchett, urban fantasy. I am a fan, a reader, a watcher, a listener. A budding writer and blogger. I am a 30 year old asexual English woman, happily single and living in York with my cat Cookie. I work for the NHS as a Receptionist/Admin Assistant and am a life-long student. My formal education is Psychology/Neuroscience based (I'm fascinated with the human mind) and I'm currently learning about Buddhism and the science behind meditation.